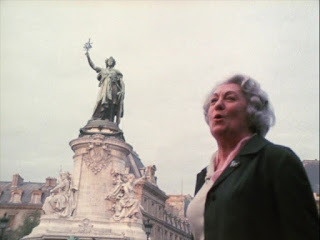 Written, co-shot, and directed by Louis Malle, Place de la Republique is a film that explores the working class and common people in and around Paris, France on the street section in which the film is named after. The film is a documentary that has Malle going around the many street corners and such to explore the ordinary lives of Parisians. Even as he tries to find something extraordinary in people who are just ordinary. The result is a fascinating and engrossing film from Louis Malle. Shot in the course of 10 days during the fall of 1972, the film is simply a story of life at the street section of Place de la Republique in Paris, France where Louis Malle and a small crew talk to various people in the streets. Throughout the course of the film, Malle with cinematographers Etienne Becker and Fernand Mozskowicz and sound recorder/editor Jean-Claude Lareux would roam around the street and find many things in this street that isn’t just filled with some regulars but also people who are just there for some reason. Yet, the people that Malle would meet prove to be just as fascinating as the many other people in and around Paris. Among them is a partially-blind woman, a wig seller, a beautiful woman who would be briefly employed by Malle to hold the boom mic, an old woman talking about living in Paris during World War II when it was occupied by the Nazis, a man in his 90s playing violin, and various others. Much of the filmmaking is simple where Malle, Becker, and Mozskowicz would shoot everything with hand-held or over-the-shoulder cameras as much of it is shot in the day with few scenes shot at night. With the help of editor Suzanne Baron collecting the footage and create jump-cuts for some of the interviews, Malle just goes for something simple in the way he films things. Even as the people he interviews are well-informed that they’re being filmed as they’re either annoyed or amused by being on camera. Malle would at times appear on camera with his crew yet prefers to have the film be focused on those he’s meeting in this small street in Paris proving that their lives are just as interesting as his. Place de la Republique is a marvelous film from Louis Malle. It’s an engrossing film that explore the lives of ordinary people at a street in Paris who prove to be very interesting no matter how ordinary they are. In the end, Place de la Republique is a remarkable film from Louis Malle.